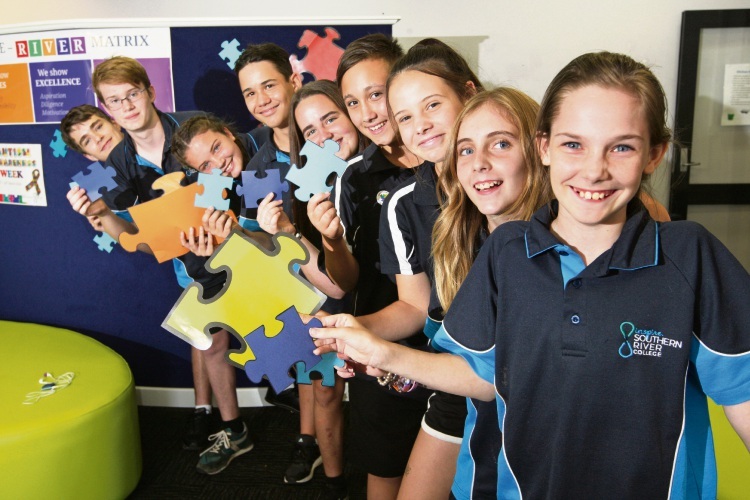 A JIGSAW symbolising connection and inclusivity was the centrepiece of Southern River College’s Autism Awareness Week activities. The school marked the week, which runs from March 26 to April 2, by inviting staff and students to write their experiences with autistic friends and family members on a jigsaw piece, which symbolised the complexity of autism. The pieces were combined and unveiled at a special morning tea on Wednesday to celebrate Autism Awareness Week and recognise the importance of connection rather than isolation. The school’s Austism Extension Program manager Kirsten Dowd said specialist-learning programs were helping attitudes towards autism change. “The spotlight is very much highlighting how with the right support and structures in place, schools, families and communities can provide excellent opportunities for these young people to be included and achieve success in whatever endeavour they choose,” she said. Ms Dowd said it was important to acknowledge the week and students were encouraged to embrace difference and diversity throughout their lives. “Part of the College’s values matrix includes the aspect of ‘identity’ and this encompasses valuing themselves and the differences of others,” she said.